In highly industrialized countries, the healthcare systems have highly advanced but public access to healthcare depending mainly on their social and financial status. According to a joint report published by the WHO and the World Bank, 400 million people do not have access to essential health care services in the world. Among this huge population, 6% of people belonging to the low- and middle-income families, are further into extreme poverty because of expensive spending on medical care. Many of these often borrow a huge amount of money from their relatives or friends, to pay for their medical bills. Many families sell their houses, lands and jewelry to make sure their loved ones are still getting the medications and treatments in private hospitals. Medical Trust organizations have stepped forward to ensure no one suffers without treatment. These organizations advocate for public healthcare rights which should be given free of cost. Trust organizations are sponsoring the overall diagnosis and medication costs of poor patients. These organizations raise funds to make sure needy patients can get their surgeries done and get access to proper post operational care. They are also spreading awareness about prevention of many fatal diseases like HIV, cancers, and other health impairment of the people around the world. When charitable organizations are doing their part for the betterment of the society, we should also step forward to fulfill our responsibilities. Just take out a few minutes from your busy schedule and try to contribute to any of these deserving organizations so that they can heal more souls and can give permanent relief to more people in sickness, and help them to get back to their normal lives. Transparent Hands is in first position, in our List of Top 5 Trust Organization Providing Free Medical Care to People in Need. Transparent Hands is a non-profit organization, which is tackling this major healthcare issue of Pakistan with the help of fundraising through its unique Crowdfunding platform. Transparent Hands conducts the surgeries of deserving patients free of cost at private hospitals, with the help of donations and charity. Donors from all over the world can use our online Crowdfunding web portal if they wish to donate. You can select any patient, fund the surgery and receive regular feedback and updates, until the patient is recovered completely. Choose the patient whose surgery you want to fund. Choose from a number of payment methods as per your convenience. Donate to that particular patient and get tax exemption. Get regular updates of that patient until he/she gets fully recovered. What makes us unique is; our transparency level that means donors will be ensured that each penny we are giving will be spent on the needy patient. We do this by uploading all the hospital bills and other documents of our patient, after his/her surgery is successfully conducted. Donor can see that the exact amount hospital has charged against the surgery of that particular patient. You want to save the lives of people by donating for their surgical treatment. 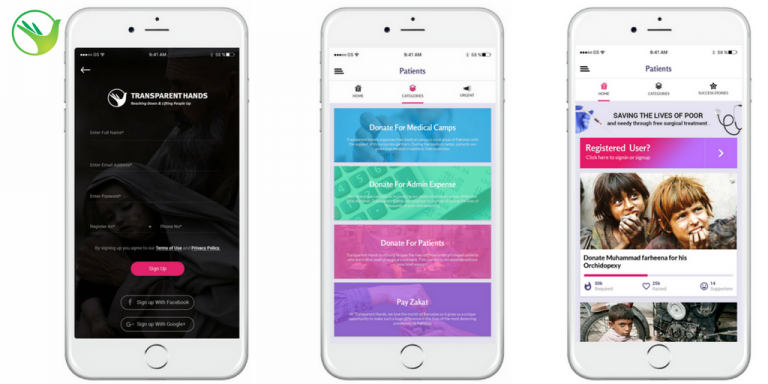 You need complete transparency of where your donation/charity is going. Donors can completely put their trust in us regarding their donations and charity. There are many people in Pakistan and all over the world, who wish to spend their money on trust organizations but we are unsure about to whom we should donate. 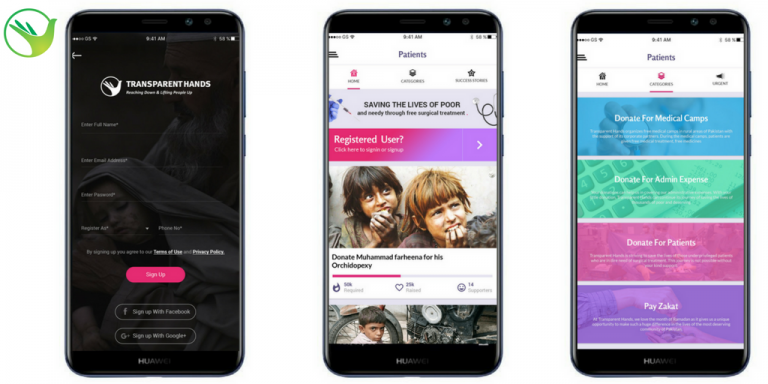 In order to ensure complete transparency, Transparent Hands uploads all the documents with the patient’s success stories so the donors can see that their money is spent on a right cause. Al-Khair Foundation is in second position, in our list of Top 5 Trust Organizations Providing Free Medical Care to People in Need . Al-Khair Foundation (AKF) is always on standby to support victims during emergencies and disasters. From internal conflicts to natural disasters, Al-Khair Foundation prides itself in being one of the first on the ground to respond. In the event of an emergency, they dispatch their relief teams to assess the situation, provide vital support and deliver necessary aid. Once on the ground, they work to deliver the essentials (clean water, food, shelter and medication) to survivors and affected people.They responded to natural disasters and crises in Pakistan, India, Afghanistan, Palestine, Nepal and the United Kingdom, as well as providing considerable support for refugees fleeing conflict in Syria, Burma and Yemen. AKF also has on-going relief projects in parts of the world ,where war and regular disasters have left the population without social stability and security.Your generous donations will help us to reach more survivors during an emergency. Your donations allow us to feed and hydrate more disaster-affected communities and keep them warm during the winter months. Al-Khair Foundation is a UK-based international NGO providing humanitarian support, international development, emergency aid and disaster relief in some of the world’s most deprived areas. Established in 2003 and rapidly growing into one of the leading Muslim charities in the UK, Al-Khair Foundation also looks to tackle issues prevalent in the UK as well, such as unemployment, education, women’s empowerment and domestic violence. Al-Khair Foundation (AKF) began with a school. In the Islamic tradition, which advocates that charity starts at home, they wanted to give back to their UK community first, and education was the best thing they knew to give. Today, Al-Khair Foundation (AKF) is a UK-based Muslim charity, and although they’ve been engaged in charitable work from the outset, education was initially their key priority. After their UK schools proved to be a success, AKF started building schools overseas. Their focus was educating orphans and children from underprivileged communities. This led to their work with widows and vulnerable women, and then to the establishment of the AKF shelters. Eventually they launched their water aid and livelihood projects, as well as the Al-Khair Foundation medical aid programmes ,2005 became a turning point for us when AKF rose to the challenge of providing emergency aid during the Kashmir Earthquake of that year. This was their first venture into the area of Overseas Disaster Relief. That October, and in the winter months which followed, AKF distributed food, shelter kits and medicine to survivors of the quake. Since then, AKF has undertaken emergency aid missions all over the world. Their support of the Haiti earthquake survivors was recognized by the United Nations in 2010. While during the Japan earthquake of 2011, they were the only UK Muslim charity working with survivors on the ground. Australian Himalayan Foundation is in third position, in our List of Top 5 Trust Organizations Providing Free Medical Care to people in Need. They are working in partnership with the people of the remote Himalaya, to improve living standards through better education and training. They work with local communities, in a long term, sustainable way. The Australian Himalayan Foundation is committed, to improving the quality of life of those living in remote areas of the Himalaya. They are working in partnership with these communities to help the most disadvantaged, meet their needs through integrated improvements in education, health and the environment. The Zanskar Valley is one of the most remote regions of the Himalaya, it is cut off from the outside world by snow for six months of the year. During this time, communities rely heavily on the local ‘amchi’ or traditional medical healers for primary health care. Sadly the region has unacceptable rates of infant mortality. They are working with the ‘amchi’ to train them in modern medical practices to complement their traditional approaches, helping to improve maternal health services in the region. Their health program focuses on strengthening primary health care with a focus on maternal and child health, mixing modern and traditional approaches. This ensures these communities have readily available health care and that women can give birth safely and with the appropriate support. Advocacy efforts have led governments to develop policies that respect the rights of people living with diabetes and access treatments they need to live healthy lives. D-Camps provide kids with type 1 diabetes with a unique experience to help them learn to manage their diabetes in a safe and fun environment. Team Diabetes is Diabetes Canada’s national activity fundraising program that offers Canadians of all fitness levels the opportunity to walk, run or hike in events across Canada and around the world, while raising funds and awareness. Clothesline is a program that collects gently used clothing, small household items and electronics. Proceeds from the program support Diabetes Canada. CDA Expos are educational events in the community. Diabetes Webinars are free webinars hosted by health-care professionals, diabetes educators and people living well with diabetes. Child Care Foundation is in fifth position, in our List of Top 5 Trust Organizations Providing Free Medical Care to people in Need.The Child Cancer Foundation is a New Zealand-based charity that offers support to children with cancer and their families.It has a high profile through public fundraising events. As of 2011, it had an income of NZ$ 4.8 million, of which NZ$1.9 million was fundraising income, with most of the rest being from donations and bequests. Child Cancer Foundation provides strength and comfort to families, parents and children impacted by child cancer. We give personalized support to each family through a one-to-one connection . We help with the big things like emotional, social and practical support. But also the little things they have probably never even thought about. We provide strength in times of doubt, comfort in times of sadness and celebrate times of joy. Every family is different and so is the support they receive. Our Family Support Coordinators are there for families from the day of their child’s cancer diagnosis. We have 18 dedicated Family Support Coordinators nationwide, helping families across both islands and coasts. Many families will be supported by two coordinators – one at the treatment centre and one in their community – who work closely together to ensure the needs of the family are met no matter where they are based. Our essential care kits includes little things that will have been forgotten in the rush to hospital and practical items to help during their stay and when they return home. Basics like toothbrushes and shampoo; a comforting blanket, pillow and books; details of the support Child Cancer Foundation provides, our Beads of Courage programme; along with hospital maps and fact-sheets, all packaged into a roller bag. Over 70% of the families Child Cancer Foundation supports have to travel outside their community to receive treatment. Even for families who live near to the hospital, the cost of petrol and parking from hundreds of trips quickly adds up! We assist with travel costs and help keep families together. The Child Cancer Foundation Challenge Research fund has been supporting local child cancer research since 1999. Child Cancer Foundation also provides grants to Health Professionals to attend relevant medical conferences, receive training and further their medical education. The relationship between poverty and health is well established in the world. The poor people tend to live in houses that are usually located in congested areas where safe drinking water, good drainage or sanitation is unavailable. They do not get access to a balanced and nutritious diet but have to work hard, and do all the physically strenuous jobs which make them weak gradually. They also have the tendency to suppress their minor illnesses, infections or pains. To sum it up, all these factors ultimately lead to major health issues among the poor. When the ill-health visits the hospitals for treatments expensive medical facilities leads them further towards poverty. This time their financial condition gets so worse that they stand in starvation and hunger with no help reaching out to them from anywhere else. 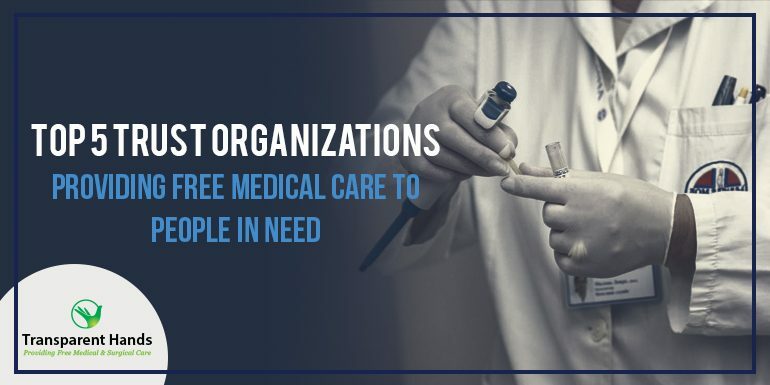 Medical Trust Organizations are working as a supportive network for this vulnerable population, so that they no longer have to deal with social pressures alone. These organizations stand firmly by the sick and poor individuals who are left alone to fight their battle on their own. They are ensuring treatment and medication for the poor so that no life is lost at an early age. Trust organizations are working to spread the message of humanity that has been weakening slowly among us. We must utilize the power of our accumulated wealth in the servitude of the poor and sick population. Your valuable donation can make up a life. The greatest achievement in one’s life is to know that a life has been saved because of your generous contribution.